Durable and comfortable with a high-quality leather construction, the Briers Lined Hide Gardening Gloves are ideal for protecting your hands while gardening. 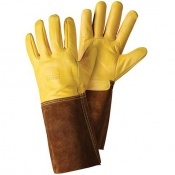 With a soft leather construction and a plush lining, they are ideal for improving safety and comfort for hands during tough gardening tasks, while the ergonomic keystone thumb design allows for easier and more comfortable movement. The product codes for the gloves are: B0014 (Size Small), B0021 (Size Medium), B0038 (Size Large). The Lined Hide Gardening Gloves protect hands from dirt while working with soil and plants. With a quality leather construction, they are ideal for tougher gardening tasks that involve handling coarse branches, stems, and plants. 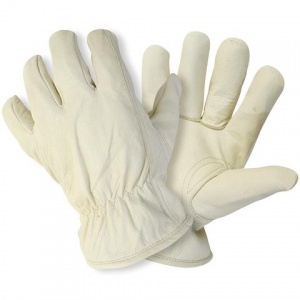 The Briers Lined Hide Gardening Gloves are available in a choice of sizes to ensure the most comfortable fit. Please consult the table below for details. Well highly recommend these gloves. 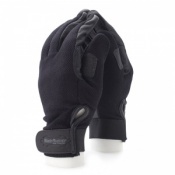 Comfortable and well protect your hands and fingers from spikey brambles. 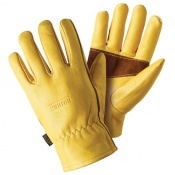 Manoeuvre your fingers around well unlike some protecting garden gloves these are brilliant. Well worth the price I paid and now thinking of getting a 2nd pair in reserve. Fabulous gloves paired with cutlass sleeves brambles are getting a good slashing!